The clock is ticking to the release of the Droid, and its smaller brother the Droid Eris, this Friday from Verizon. 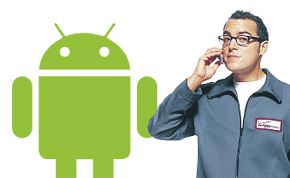 The media is filled with rhetoric drawing comparisons between the Droid and the iPhone. Those stories miss the point that the real battle isn't between the Droid and the iPhone, but between Verizon and AT&T. The media is filled almost entirely with hyperbole comparing the Droid to the iPhone and discussing whether or not the Droid can knock the iPhone off of its mythically high pedestal. There are head-to-head comparisons, opinions claiming the Droid is superior, and articles pointing out that the iPhone killer is an elusive concept because iPhone users are devoted and won't be defecting en masse to adopt the Droid. From preliminary reviews it seems that the Droid is a relatively impressive device. On paper, it compares favorably against the vaunted iPhone. In a head-to-head battle with all else being equal, perhaps the battle would be a close one. But, all else isn't equal. One device is offered by Verizon and the other device is offered by AT&T. The main event in this heavyweight fight is the battle between the wireless service providers, not the devices. Verizon doesn't need the Droid to beat the iPhone per se. It only needs the Droid to be an attention-getting device that provides features users want on a network users prefer. AT&T has faced a fairly steady stream of complaints from customers--the majority of those complaints coming from the dedicated legions of iPhone users. There have been complaints that the battery can't be replaced, complaints that the data service is slow, complaints that 3G access is dysfunctional, complaints that the device couldn't do MMS messaging, and more. AT&T and Apple have also been the focus of controversy related to rejecting the Google Voice app, and trying to block third-party VoIP solutions. iPhone users love their iPhones, but they aren't quite as dedicated to the wireless provider the iPhone is tied to. Verizon seems to be the number one wireless carrier in the country for a reason. It has a better quality network and higher customer satisfaction, and it is capitalizing on those attributes in its marketing. In preparation for the Droid launch, Verizon has two clever campaigns. The iDon't ad campaign is aimed at spotlighting the deficiencies in the iPhone and highlighting the fact that Droid has those capabilities. The other campaign plays off of Apple's "There's an app for that" iPhone campaign to compare maps of the 3G coverage of Verizon vs. AT&T. Do you want to know why you can't find a 3G connection with AT&T? There's a map for that. Regardless of how the devices fare against each other, customers who already have an iPhone have already made their decision. They are already contractually obligated to AT&T for the foreseeable future. The Droid, and the Droid Eris, combined with the network and customer service of Verizon make a compelling pitch for new users to choose Verizon and for customers of other providers (including AT&T) whose contracts are expiring to look at switching. Even the operating system battle is a bigger deal than the device battle. The iPhone is more than a device, it is also its own operating system platform. The iPhone operating system is only available on the iPhone device which is only available from AT&T. Google's Android operating system is poised to squash the iPhone operating system because it is available on a diverse variety of devices from a range of wireless providers. Android has iPhone outnumbered and outflanked. In the end wireless providers, mobile operating systems, and flashy devices will continue to evolve. At the rate things are going the iPhone may be the only jewel in AT&T's crown, and AT&T will find that the iPhone alone is not enough of a strategy to gain, or even maintain, market share in the competitive wireless industry.